Set her heart on fire with this glittering Hearts of PANDORA stackable ring featuring silver hearts and stunning zirconias. Buy online or in store. 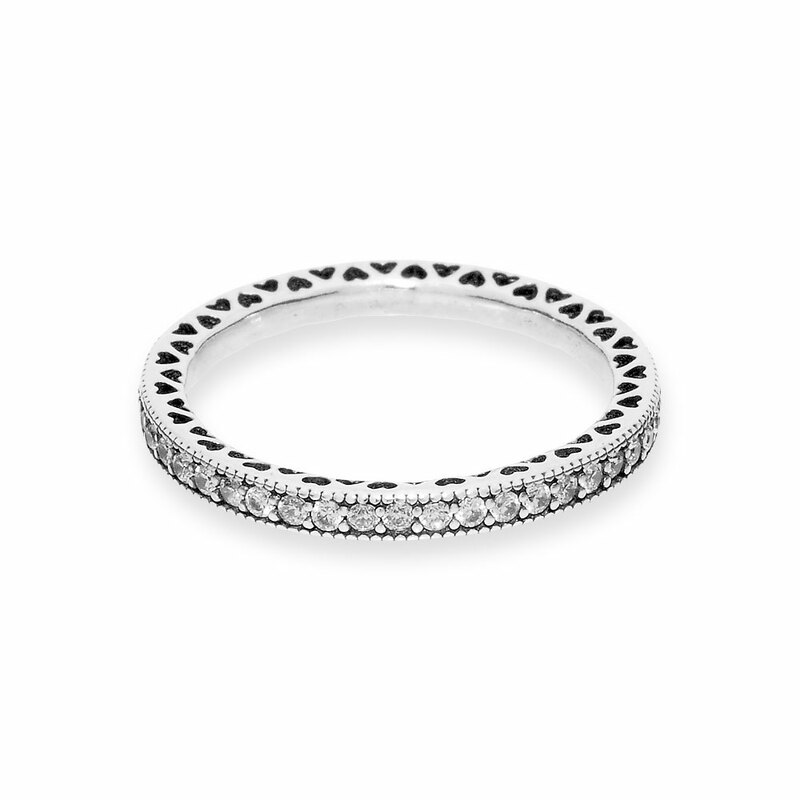 Hearts of PANDORA Silver Stackable Ring is rated 4.6 out of 5 by 81. Rated 5 out of 5 by HannahWilson from Great quality! I’ve had these rings for over a year now. I use it as my wedding band! Also have one on top of my engagement ring to give it an extra WOW! Factor. Super durable and shiny! CZ looks like real diamonds! It’s beautiful! Rated 5 out of 5 by MrsHurt from Looks amazing My husband bought this as my wedding band the night he ask me to marry him. I seen it loved it and they had my size in the store, 4 1/2. I’m a hairdresser and this ring has stood up everything. I’ve never taken it off and we will be married two years in a few days! Rated 5 out of 5 by Katie326 from Perfect Love it! I've been wanting another band but not wanting to spend the money.....perfect! Rated 3 out of 5 by BOShea from Pretty but... My boyfriend bought me this ring, wore it a few months and a single stone fell out. Went to Pandora and ordered a new one. Have now worn this one for a couple months and another single stone has already fallen out again. I will now have to go back a second time to have them replace it again. If it happens a 3rd time, might just have to return it and get a different ring. Not liking having to replace it all the time. Rated 1 out of 5 by Ra14chel from Stone fell out within a couple weeks I bought this ring on Black Friday (11/23/2018) and it already lost a stone! I haven't even had this ring for 1 month and I wore it maybe 5x. I and am very disappointed by the quality of this ring. Would NOT recommend! Rated 5 out of 5 by Armychik92 from Great buy I Absolutley love this ring. It is a great addition to my first ring. And I can even wear it alone. Rated 5 out of 5 by Devin01 from Great item My girlfriend loved it, she loved how it sparkled.